Select or Edit your Dream 11 Team SRH vs KXIP before the match. Stay tuned for the toss. Coming up in five minutes. 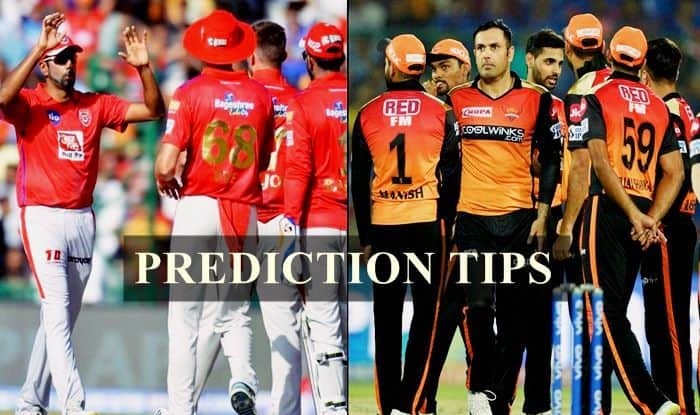 Kings XI Punjab will host Sunrisers Hyderabad in their den and it is expected to be a mouthwatering clash as both the teams have won three out of their five matches played so far in the league. Hyderabad is at the third spot in the points table as Punjab are placed sixth in the points table. Hyderabad is higher, thanks to the net run rate. The problem both teams have encountered in the tournament is the poor show of the middle order. For Hyderabad, beyond David Warner, Johny Bairstow, the others in the middle-order have not fired and that is a major reason why they lost two matches. They are also missing their star batsman Kane Williamson, who in all probability will join the team soon. For Punjab, they have fired in patches. For example, Sam Curran taking a hattrick or be it important half-centuries from Chris Gayle and KL Rahul. Consistency has been a problem for both the teams and that is something they would like to avoid before they head into the later stages of the league. Wicketkeeping: It is a big toss up between in-form Johny Bairstow and extremely talented KL Rahul. It is a difficult choice, but if one has to pick one, it is safer to go for Bairstow as he is the player in-form. Batting: Both sides have big names like David Warner, Johny Bairstow, Mayank Agarwal, Vijay Shankar, Chris Gayle, KL Rahul, Sarfaraz Khan, and David Miller. It is a good batting track hence it is best to bet on Chris Gayle, David Warner, Johny Bairstow, KL Rahul and Sarfaraz Khan (the young kid is in good form). Bowling: Both sides also pack good bowlers like Mohammed Nabi, Rashid Khan, Bhuvneshwar Kumar, Sam Curran, Andrew Tye, and Ravichandran Ashwin. Rashid Khan can be picked as the spinner along with Ravichandran Ashwin and the pacers you can pick are Sam Curran, Bhuvneshwar Kumar, and Andrew Tye. : David Warner, Chris Gayle, Johny Bairstow (WK), David Miller, Sarfaraz Khan/ Mayank Agarwal, Vijay Shankar, Sam Curran, Ravichandran Ashwin, Bhuvneshwar Kumar, Rashid Khan, Mohammed Nabi.